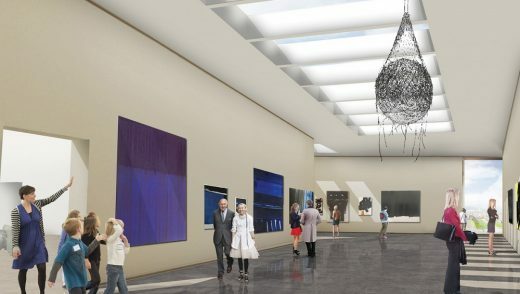 Work has started on the interior fit-out of Aberdeen Art Gallery by Glasgow’s Hoskins Architects. 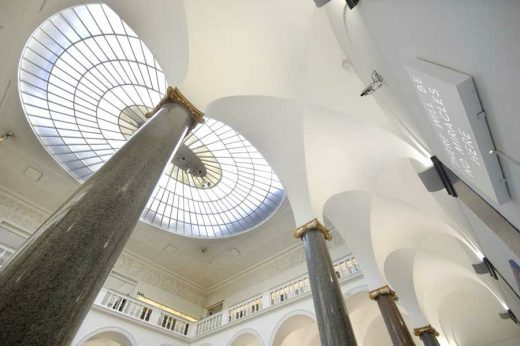 The £30m redevelopment converts the A-listed building into an arts venue. The project includes 21 new exhibition and display galleries as well as improved visitor facilities alongside transformation of Cowdray Hall into a performance space and refurbishment of the Memorial Hall as a place of quiet contemplation. 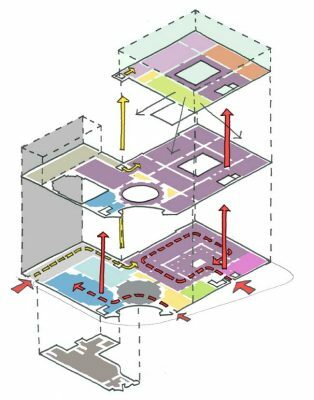 To accommodate these functions a new wing will be built to the rear whilst a pitched roof and parapets on the main building will make way for a new sculptural copper-clad penthouse level hosting temporary galleries and a learning zone. This extension will make the most of its elevated position to include rooftop terraces offering expansive views across the city centre. Aberdeen City Council’s deputy leader Cllr Marie Boulton said it is a once-in-a-lifetime opportunity to achieve something really special for Aberdeen by forming a world-class cultural centre. Completion of the works is due for 2017. The architecture practice’s initial proposals also include the addition of new extensions to the rear of the complex of buildings to provide improved back of house facilities and at roof level to provide new conditioned gallery spaces. 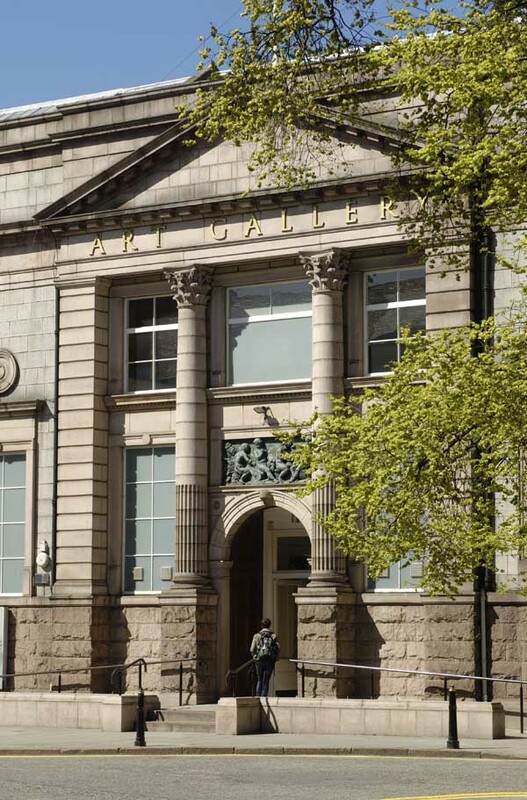 In addition to providing new gallery spaces, the aim of the contemporary rooftop element, coupled with the reconfiguration of the street to form a new public arrival space is to increase the presence and perception of Aberdeen Art Gallery and the accessibility of its collections to a wider audience. 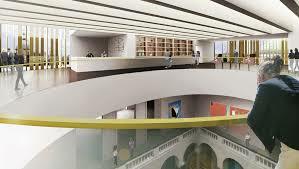 Given the Art Gallery’s pivotal position close to His Majesty’s Theatre, the Belmont Picturehouse, citymoves, the Central Library and Union Terrace Gardens, the ongoing development of a cultural quarter will be enhanced by the development. This design study phase will be financed by the Marguerite McBey Trust, which was established in May 2001 to disburse the bequest of Mrs McBey to fund projects which promote contemporary art and the work and life of her husband, the celebrated artist, James McBey. 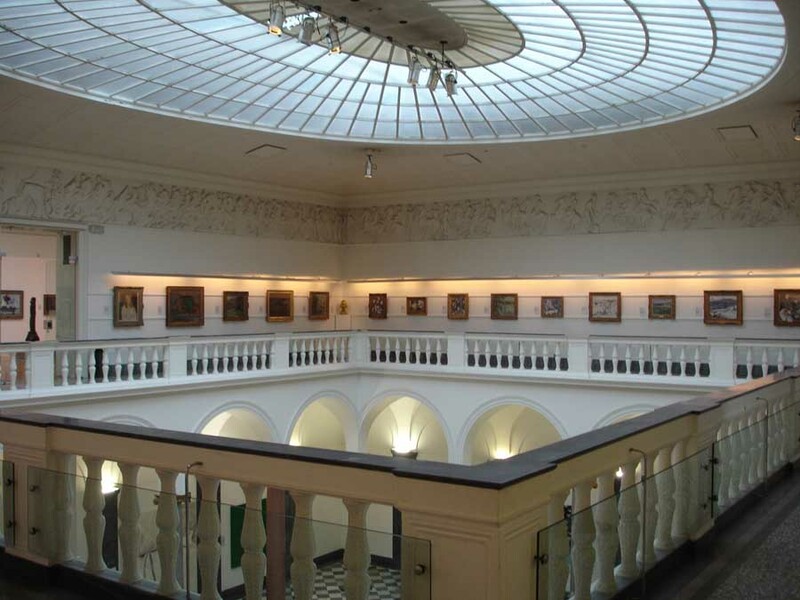 The Trust also supports the wider work of the Art Gallery & Museums Service. ” improving The Cowdray Hall. The process of inviting interested parties to bid for the commission began last year. Information packs were issued to 40 architectural and design practices. 18 responses were received by the closing date. These submissions were evaluated and a shortlist of six organisations was invited to present their submissions in more detail. 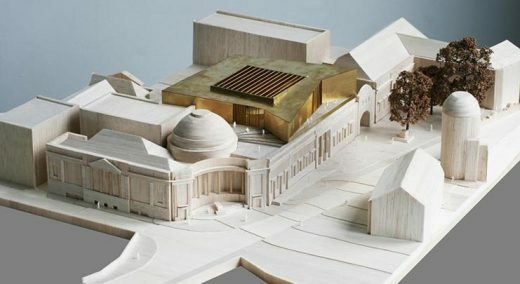 It is currently estimated that the redevelopment of the Aberdeen Art Gallery site will cost around £20 million. It is expected that the redevelopment project will be eligible for external grants and funds. Vice Convener of the Education, Culture and Sport Committee Martin Greig said: “Aberdeen City Council has a strong tradition in promoting the arts for all ages and backgrounds. 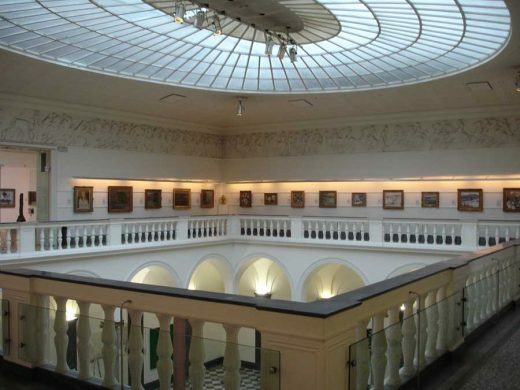 The Art Gallery is held in great affection by Aberdonians. 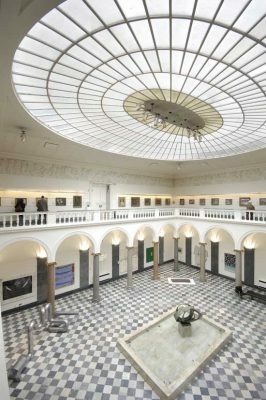 We are right to be proud of this magnificent museum of art treasures that has been carefully built up over centuries of careful collecting and generous donations. Councillor Greig added: “The funding from the McBey Trust is greatly welcomed and much appreciated. This funding is enabling the council to find ways of enhancing this key cultural asset so that generations to come can enjoy the marvellous items in our constantly growing collection. “The city’s art and museum treasures are jewels in its crown. Aberdeen needs to make the most of what we have to protect and enhance the quality of life of citizens and to make sure that Aberdeen is an attractive and desirable place in which to live. “Artistic enjoyment is not an optional extra. 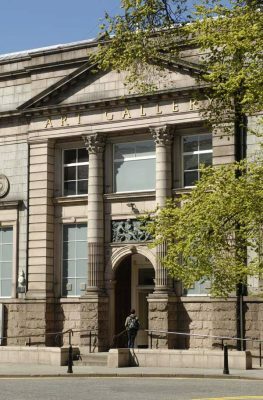 Set up in 1998, Gareth Hoskins Architects – architects for the Aberdeen Art Gallery Renewal – is recognised as one of the leading architectural practices in the UK. The practice’s 30 strong team have worked on a wide range of prominent projects ranging from the new Culloden Battlefield Memorial Centre to the Scottish Pavilion for the Scottish Government at the International Architecture Biennale in Venice. The practice’s engaged approach and the creative design solutions that come out of this have been recognised through a series of international exhibitions and awards. In 2006 the practice were the first Scottish practice to be named as UK Architects of the Year and this year were named as Architectural Practice of the Year at the Scottish Design Awards.